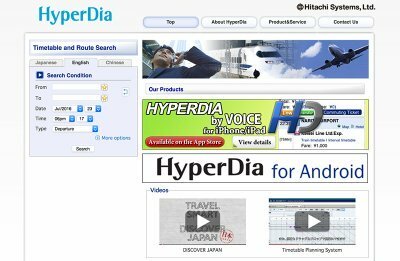 If you are travelling around Japan and need help planning your travel around the country then Hyperdia will help. You can use the website to find the most efficient routes and to see what is covered by your Japan Rail Pass. You can also use it as an online timetable for train routes all around the country. If you’re looking for inspiration for your trip to Japan you can use our great range of sample itineraries here. Hyperdia is a complete timetable of all transportation routes in Japan. 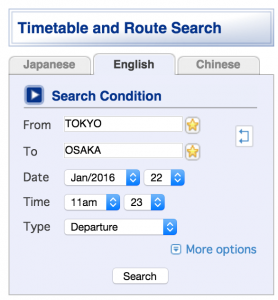 It is available in both Japanese and English, and it provides information on how you can get from one point to another – whether by train, bus, or plane. You can view it online, or download it to your Android or iPhone device. When using the tool you will need to follow the instructions below to make sure the routes are eligible for the Japan Rail Pass. Enter in your departure station, arrival station, and intended date and time of travel. Click on “More options” and uncheck the boxes labeled “NOZOMI/MIZUHO/HAYABUSA (SHINKANSEN)*”, “Airplane”, “Airport Shuttle Bus” and “Private Railway” to only get routes where a JR Pass is valid. Then click “Search” to generate results. * Please note the JR Pass includes the HAYABUSA (SHINKANSEN) so you’ll need to re-tick that box if you plan on using it for the journey. Be aware that Nozomi/Mizuho are not included when looking at the results. From the options, select the one that is closest to your planned itinerary. Take note of all the information provided regarding your chosen option so you clearly understand the route or any conditions as apart of your itinerary.